Working from home is fun as you can move around and be your own in your space. But sometimes that lovely workspace you see others have, with that awesome beautiful desk (but oh so expensive) and build-in cabinets for storage that you want so bad, isn't really something you can afford from the start. In my case we saved a bit of cash to have a home office. It was in the plans from the start, so I bought some (cheap) chairs, that eventually I would have to change because they are not totally comfy. But for now they will do. And our desk and storage cabinet are from the awesome IKEA. I rearrange the desks in a way that we had more space. Buuuttt...going back on the ones that don't have that, they need to be creative. Seriously, this image above is a great way to save on money, but still have an awesome work space. As you can see you can use wooden boxes that you can find at your local grocery store. 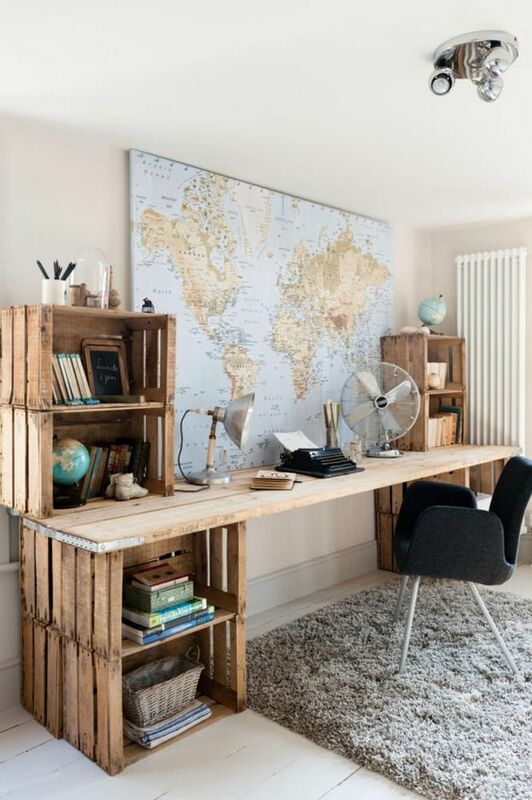 You can put together some wooden boards or even an old door , to use as a desk. This is such a great idea especially if you are in giving things a second life. Adding a cool rug, a comfy chair you're all done. Making your workspace complete, you can add little personal items. Here you can see several globes and that awesome world map. Adding vintage pieces will always bring extra character to your working space. The thing you have to remember is that your working space has to inspire you and motives you to work in. So don't be afraid to add the personal and favorite touches. What do you think of this working area? Do have a home office at home? How did you tackle the design? Let me know in the comments below. I love your work space! I wish I would have thought of something like this before I bought a cheap desk from Office Depot. This probably costs less and looks way nicer than what I bought! This has to be the awsomest desk ever! I know right...I fell in love immediately when I saw this picture. Changing your workspace is like changing your livingroom or bedroom. You need the change for more inspiration in your work or life. And it's awesome that feeling when sometimes looks totally different again. Thanks for stopping by Moe. We're in the middle of moving our office stuff down to what used to be the dining room (or catchall if I'm being honest!). Our office wasn't really even close to what I wanted it to be before this, though. We have a long way to go!